On 29 October 2015, H.E. Ambassador Liu Xiaoming met with Sir Mark Grant, the new National Security Adviser to the Prime Minister of the United Kingdom. The two sides spoke positively of President Xi Jinping's just concluded state visit to Britain and agreed that the historic visit was a complete success. This visit opens a golden era in UK-China relations featuring enduring, inclusive and win-win cooperation. 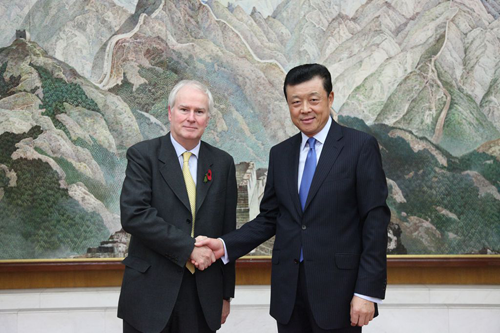 China and the UK commit to building a global comprehensive strategic partnership for the 21st Century. Ambassador Liu and Sir Grant exchanged views on the follow-up actions of the outcomes of the state visit and on strengthening China-UK co-operation in security and other areas.